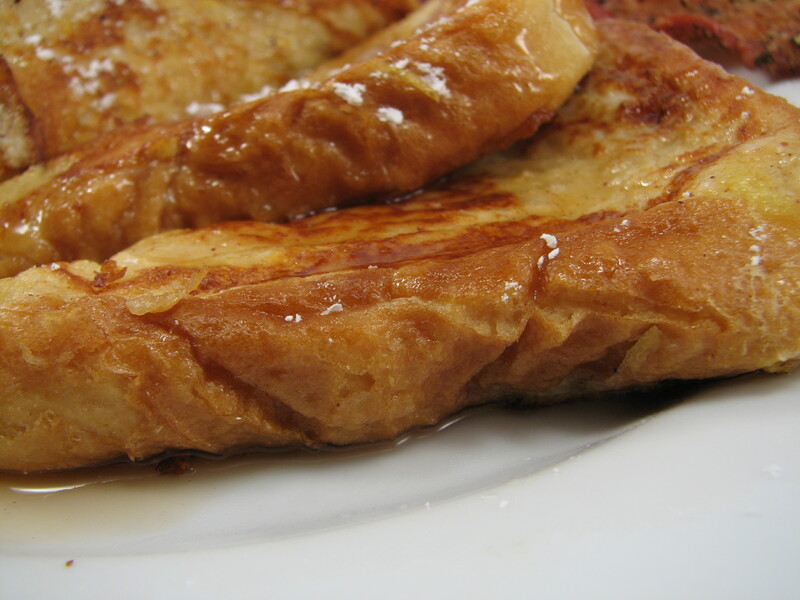 My love affair with French Toast has been lifelong. It’s hands down the best breakfast in my opinion. As a kid we went out to breakfast as a family on weekends (my parents still do it to this day). We had a few favorite breakfast joints near the house that we’d rotate through each weekend. 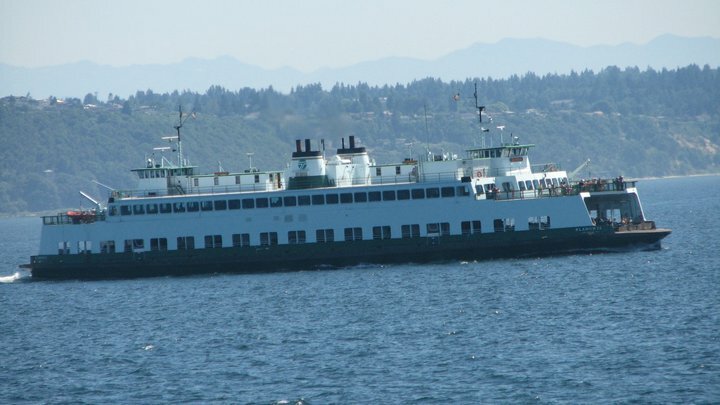 My favorite breakfast place we went to was in downtown Edmonds, just blocks away from the ferry. 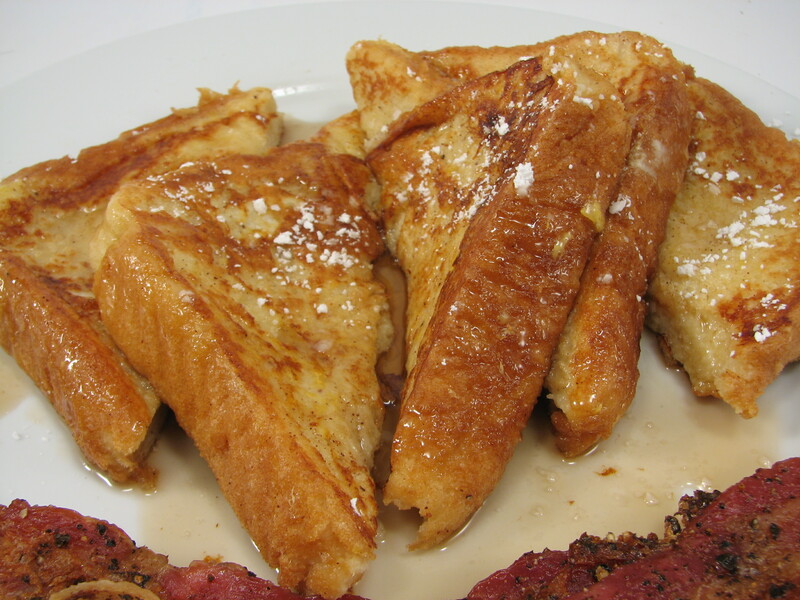 I would always order French toast. That was my favorite breakfast. The little pad of butter slowly melting as it’s nestled between the slices of toast…the warm syrup…the powdered sugar…heavenly! I stopped eating French toast for a really long time. I just couldn’t justify the calories. I slowly started eating it again when I realized that French Toast wasn’t that bad. 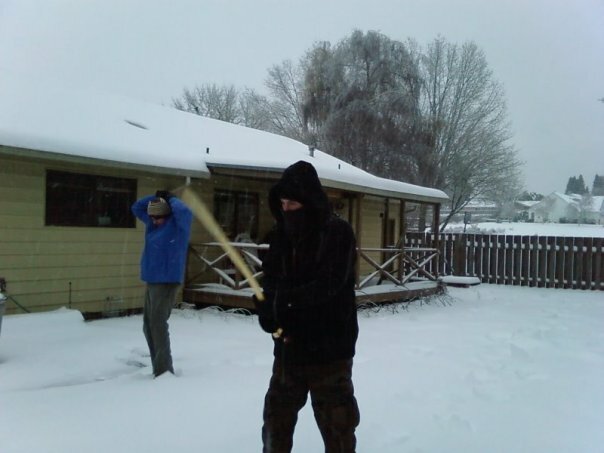 When Michael and I were first dating I got snowed in at his house one weekend and the snow just kept coming. Luckily we were within hiking distance of a nearby Safeway. 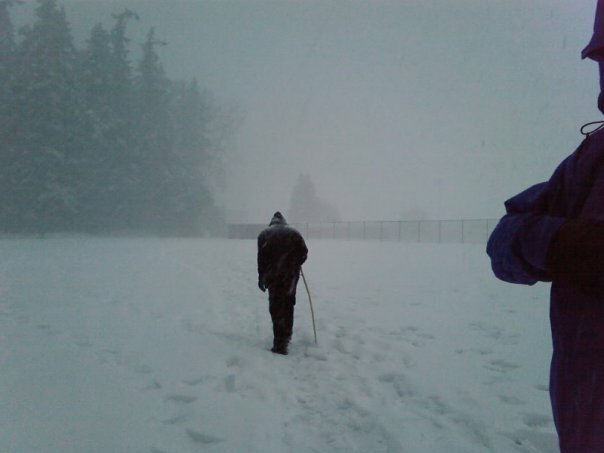 We trekked in the snow to get the ingredients. Michael and I started making this recipe for French Toast and we’ve never done it another way since. Of course it’s a Martha recipe. Whisk together eggs, milk, juice, vanilla, cognac, sugar, zest, cinnamon, nutmeg, and salt in a bowl; set aside. Place bread in a shallow baking dish large enough to hold bread slices in a single layer. Pour egg mixture over bread; soak 10 minutes. Turn slices over; soak 10 minutes more or until soaked through. Preheat oven to 200 degrees. Place a wire rack on a baking sheet, and set aside. Heat 2 tablespoons butter and 2 tablespoons vegetable oil in a skillet over medium heat. 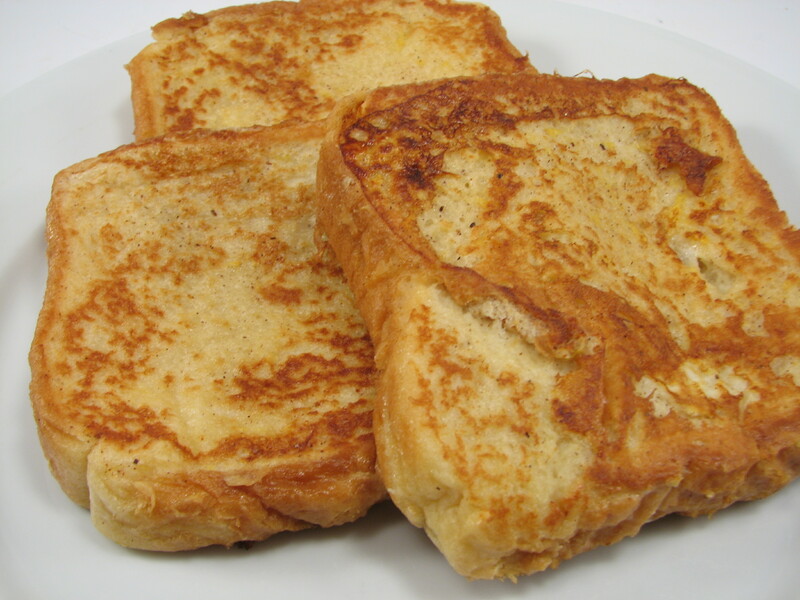 Fry half the bread slices until golden brown, 2 to 3 minutes per side. Transfer to wire rack; place in oven while cooking remaining bread. Wipe skillet, and repeat with remaining butter, oil, and bread. Keep in oven until ready to serve. Serve warm with maple syrup, if desired. The secret that makes this recipe so amazing is the orange juice and lemon zest. Do not leave that out because it’s pretty fantastic. 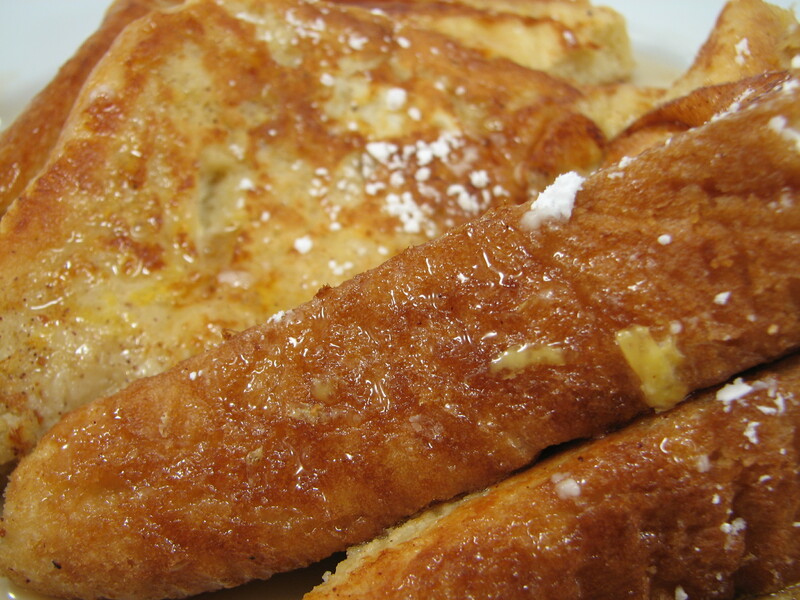 I’ve been craving this French toast for a few weeks. It’s been over a year since we’ve made it. I think the last time we made it was for my parents for breakfast when they visited last summer. It was time to make it. We mixed the wet ingredients in a jug with a lid and then shake it up to mix it. 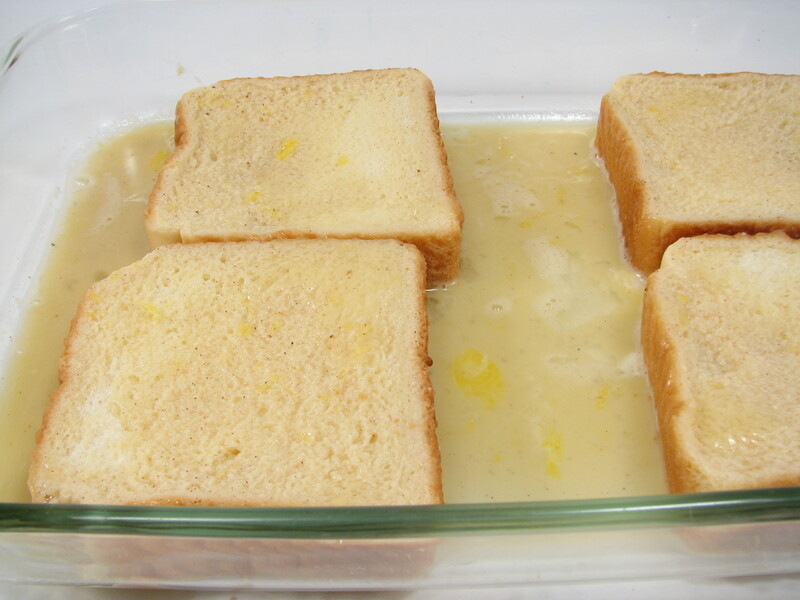 I put the bread slices into a dish and then pour the liquid into the dish for the bread to soak it up. I flip the bread a few times until it’s all the way soaked and then Michael cooked them in the skillet until they were golden brown. Michael also made some bacon to go with out French toast. I sprinkled a little bit of powdered sugar on top of the toast. I heated the maple syrup in the microwave and dinner was served! Using the right bread makes all the difference. I grabbed Texas Toast this time because it was thicker and the store I went to didn’t have Brioche (but that is preferred). This recipe is pretty fantastic and don’t get discouraged by how involved it might be. It’s more involved than a simple French toast recipe but this one is so much better than anything I’ve ever had. 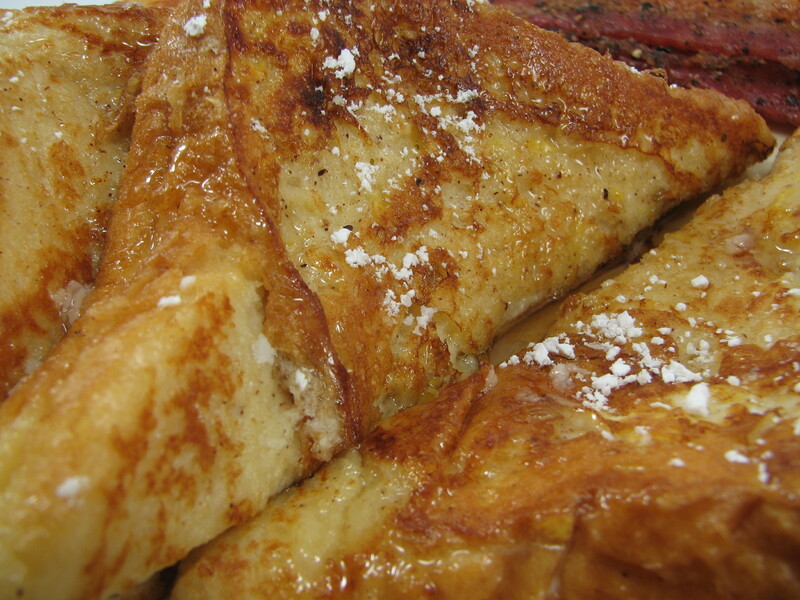 It’s much better than even restaurant French toast! 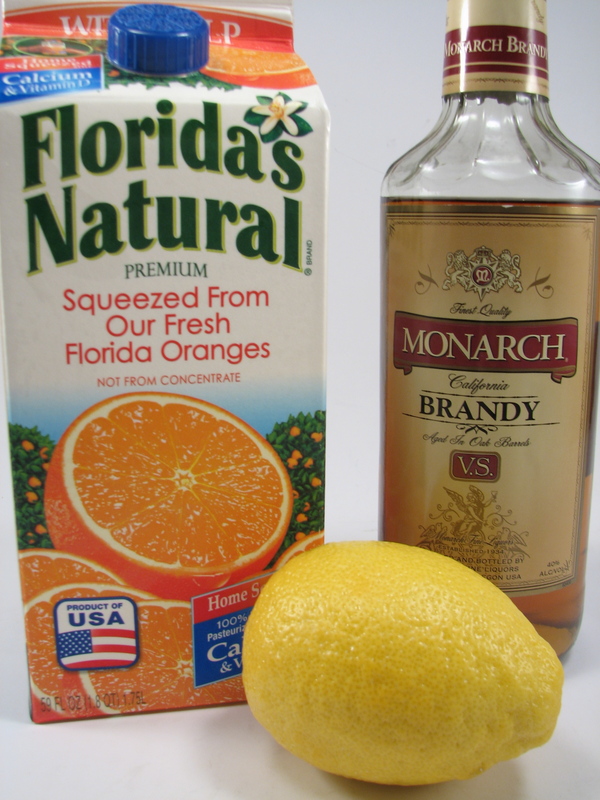 What makes this recipe so amazing is the orange juice and lemon zest. Trust me. You don’t want to leave those ingredients out. Enjoy! 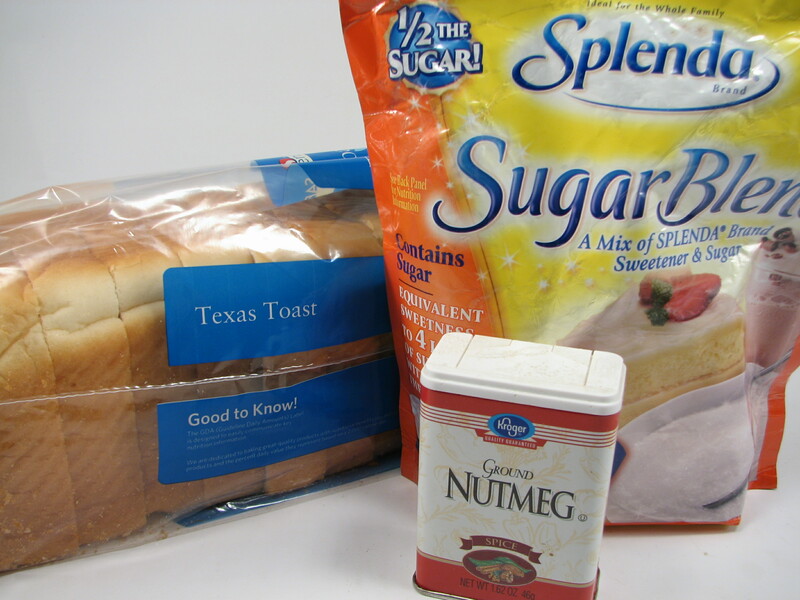 A serving size is one slice of bread and runs about 300 calories. I substituted the Splenda blend so that might cut down the calories by 25-50 or so. Breakfast for dinner! Yay! QUESTION: What’s your favorite breakfast? Do you ever have breakfast for dinner? Let me know how she likes it! I LOVE this recipe! Looks great! I’ll have to make this one sometime. My favorite breakfast is definitely a seafood spin on eggs Benedict (crab cakes, smoked salmon, etc. — pretty much any of them will do). It is really great. I love this recipe. Now I’m craving your breakfast! That sounds fantastic to me too. 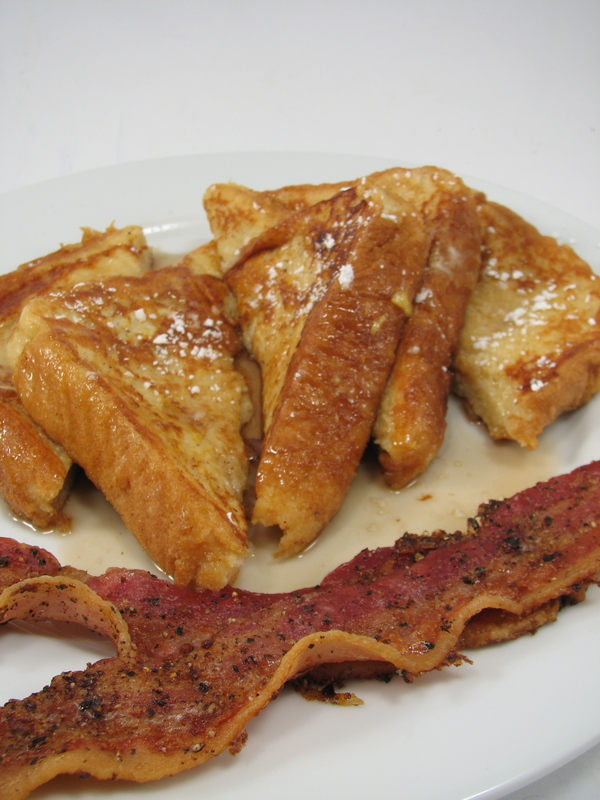 I looooove french toast! I haven’t had it in ages though! I do breakfast for dinner quite a bit, but almost always it’s eggs and toast – my favs! The other times we’ve done breakfast for dinner we did a frittatta. Or a quiche. That’s another good one!